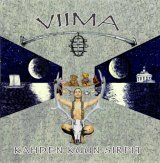 Review: "Viima: Kahden Kuun Sirpit" - Sea of Tranquility - The Web Destination for Progressive Music! Finnish band Viima have released their second album, Kahden Kuun Sirpit, over two years in the making. This is quite a trip into symphonic progressive rock, and one that I enjoyed very much. Consisting of Hannu Hiltula (vocals, soprano sax, flute), Kimmo Lahteenmaki (keyboards), Mikko Uusi-Oukari (guitars), Aapo Honkanen (bass) and Mikko Vaarala (drums) the band plays symphonic rock firmly rooted in the 70s style made popular by such bands like Genesis and Camel. Like those bands, Viima never gets too heavy, and has a definite folk influence. The music flows nicely having dreamy textures and plenty of symphonic elements. A variety of keyboards are used including Mellotron, analog synths, Hammond, piano and Rhodes piano; quite an impressive list to say the least, giving these songs a certain lushness that all symphonic music should strive to have. The songs are long enough to forge their own creative sounds and are always done in a very tasteful way. This is not a "see how fast I can play" type band, but one that makes every note count. The guitar play of Uusi-Oukari also makes his presence felt. His playing is not flashy by any means but provides tasty leads and rhythmic textures exuding pure class with every note and chord. The vocals of Hiltula are a little flat at times, especially early on but do improve. The symphonic opening tune, "Autio Pelto", at times reminds me of Kansas with the flute parts having a Tull feel. At first the vocals of Hiltula display little emotion but get better as the song progresses. Nice background harmonies are used to good effect. Melody and songwriting never take a back seat on any of these songs ensuring an enjoyable listening experience. Waves of synths mark the beginning of "Unohtunut" increasing the dramatic nature of the music. Fluid guitar, prominent bass and runs of Hammond organ help make this one another winner. "Sukellus" features more Hammond, pleasant synths and an interesting middle section where Vaarala shows his drumming skills. The album's epic is the twenty-two minute title track. With Hiltula's clear voice over washes of synths and flute bringing back memories of Camel, it is off to a good start. The piece breaks into a funky section, however Hiltula's voice lacks emotion here. He is much more effective when he delivers with more conviction. From funk to jazz inflected rock with organ fills reminding of 70s Steely Dan, and many parts recalling the glory days of Camel, this song has much to offer, and the vocals do get better. Add to that a guitar solo laden with emotion and you have a fine ending to a very good album. Although the vocals are not always spot on the music speaks for itself and should be enjoyed by anyone interested in the softer side of symphonic rock.